Ninjas, Kittens, Crafts: Weekend Randomness #4 - The Butler Did It! Many of you know I like to read, and are aware that my proclaimed first genre of choice is fantasy, but I like to dabble in romances. However, not as widely known is the fact that I also love murder mysteries. And not the silly suspense novels that are popular nowadays, but classic murder mysteries such as Agatha Christie and Dorothy Sayers wrote. I want a list of possible suspects, a murder, and motives in my mysteries. If possible, I'd also like an English manor house in which the murder is committed. I am so in love with murder mysteries, that when I first saw those boxes called "How To Throw a Murder", I knew I had to host one. I spent years considering it, but Paul finally made me pull it all together by promising that he'd handle food. We have held two so far, and I want to host a third one like no one's business. Christy, Paula, and Helen have helped bring up the awesomeness level of these gatherings by wearing over the top outfits. 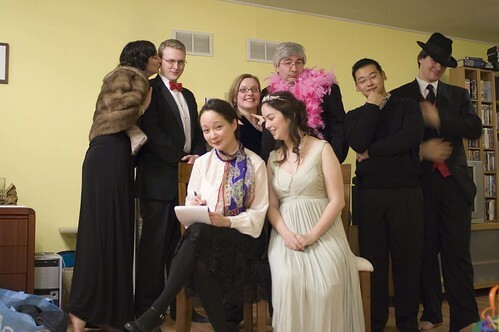 If you love murder mysteries, I highly recommend that you throw a murder mystery. Act in character! It's a blast, and by the time the night's over, you'll be shouting, "Sure, I'm a murderer and adulteress, but I'm not THE murderer!" And, really, how many times in your life do you get to yell something like that? All I'm going to say is, "Act your part!" is a genius idea for a picture. Genius. This is an awesome idea, and I love the photo!! !